Suggested Use: Adults take 1- 2 capsules daily with food, in divided doses, or as directed by your healthcare professional.Avoid this product if pregnant or lactating. If taking prescription blood thinners such as Coumadin (warfarin) consult your physician prior to use. 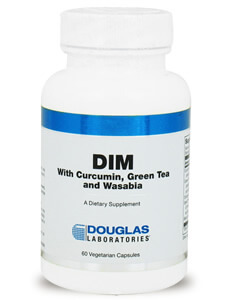 DIM® Enhanced with Curcumin, Green Tea and Wasabia – DIM® Enhanced, provided by Douglas Laboratories, is a microencapsulated form of diindolylmethane, with curcumin, green tea, and wasabia designed to support healthy hormone balance and immune health. Microencapsulated DIM by BioResponse® is a patented, absorption-enhancing formulation to ensure proper assimilation by the body. Diindolylmethane (DIM) is one molecule known for the supportive role it plays in stimulating natural detoxification enzymes and supporting normal hormone metabolism. As a natural component derived from indole-3-carbinole and cruciferous vegetables, DIM has shown in studies to support the 2-hydroxylation instead of 16-hydroxylation of certain estrogen metabolites. MERIVA® CurcuminStudies have shown that curcumin, a naturally occurring biologically active group of compounds from Curcumalonga (turmeric), can function as efficient antioxidants and can help regulate the body’s normal response to inflammatory processes. Curcumin can also play an important role in maintaining healthy angiogenic balance and help to support the body’s detoxification processes. † Since curcumin exhibits poor oral absorption in the body, Douglas Labs has chosen ahighly bioavailable curcumin called MERIVA®. Pharmacokinetic comparison studies have shown MERIVA® to have up to a 20-fold improvement in bioavailability versus the standard 95% turmeric extracts due to proprietary PHYTOSOME technology which increases hydrolytic stability.Wasabia JaponicaWasabia, a member of the cruciferous vegetable family, contains long chain isothiocyanates (ITCs). These ITCs are believed to be 10-25 times more potent in the detoxification process than most ITCs found in cruciferous vegetables. These long chain ITCs are unique to wasabia and are not commonly found in other cruciferous vegetables. DIM® Enhanced may be a useful dietary supplement for individuals wishing to support healthy estrogen detoxification, hormone balance and immune support. Harmless changes in urine color may occur if less than recommended daily water intake is consumed. Zeligs MA, Diet and estrogen status: the cruciferous connection. J of Medicinal Food 1998 Nov 2; 1: 67-82.Zeligs MA, Jacobs I, Facilitated absorption of a hydrophobic dietary supplement. Controlled Release Society Proceedings 1999: in press.Bradlow HL, et al., 2-hydroxyestrone: the ‘good’ estrogen. J Endocrinol. 1996 Sep; 150 Suppl:S259-65.Bradlow HL, et al., 16a hydroxylation of estradiol: a possible risk marker for breast cancer. Annals NY Acad. Sci. 1986; 464: 138-151.Bonnesen C, Eggleston IM, Hayes JD. Dietary indoles and isothiocyanates that are generated from cruciferous vegetables can both stimulate apoptosis and confer protection against DNA damage in human colon cell lines. Cancer Res 2001 Aug 15;61(16):6120-30.Chen DZ, Qi M, Auborn KJ, Carter TH. Indole-3-carbinol and diindolylmethane induce apoptosis of human cervical cancer cells and in murine HPV16-transgenic preneoplastic cervical epithelium. J Nutr 2001 Dec;131(12):3294-302.Dalessandri KM, Firestone GL,Fitch MD, Bradlow HL, Bjeldanes LF. Pilot study: effect of 3,3′-diindolylmethane supplements on urinary hormone metabolites in postmenopausal women with a history of early-stage breast cancer. Nutr Cancer. 2004;50(2):161-7.Fujiki H et al. Cancer inhibition by green tea. Mutat Res 1998;402(1-2):307-10.Marczylo T., Verschoyle R., Cooke D., Morazzoni P., Steward W., Gescher A. Comparison of systemic availability of curcumin with that of curcumin formulated with phosphatidylcphosphatidylcholine. Chemother. Pharmacol. 2007, 60, 171-177.Maheshwari RK, Singh AK, Gaddipati J, Srimal RC. Multiple biological activities of curcumin: A short review. Life Sci. 2006 Jan 12Morimitsu Y, Hayashi K, Nakagawa Y, Horio F, Uchida K, Osawa T. Antiplatelet and anticancer isothiocyanates in Japanese domestic horseradish, wasabi. Biofactors,. 2000;13(1-4):271-6. Suggested Use: Adults take 1- 2 capsules daily with food, in divided doses, or as directed by your healthcare professional. Avoid this product if pregnant or lactating. If taking prescription blood thinners such as Coumadin (warfarin) consult your physician prior to use.